Non-secure video platforms enable video embed through iFrames. These iFrames however can be used by anybody to download or share the video. VdoCipher uses a unique embed code per session to play videos. This embed code uses a short-lived access token, called an OTP. Our use of an OTP ensures that videos are authenticated in every session, so that only logged in paying users get to watch your premium content. You can find the API secret key for your account by logging into the Dashboard -> Config tab. To generate OTP and playbackInfo, your site backend has to make HTTP POST request to API server using the API secret key. The API URL has to include the video ID. The API call returns OTP and Playback Info, which your site backend has to then add to the video embed code. You can find more details and sample codes for generating OTP from the Server API Docs. 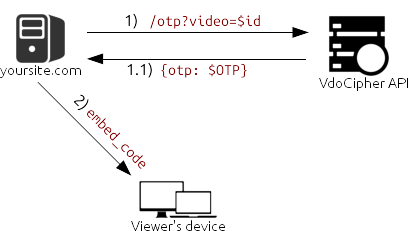 Your website backend needs to send the OTP and playbackInfo to the site frontend, to authorize video playback. More details on the player embed code can be found in the VdoPlayer Reference. You may wish to change the id of the global div, from embedBox to something more unique. For instance you may append a random number to embedBox, so that each video player displayed on your page has a unique id. There are broadly two kinds of web applications - MVC apps and SPAs. VdoCipher integration for the respective use cases differ slightly. In MVC apps the OTP can be generated when the page itself is loading. You can pass the OTP and PlaybackInfo as parameters from Controller to View. With these parameters added to the embed code your video would be ready to play. In an SPA it is recommended to create an API endpoint which can authenticate the logged-in user and check their access to the requested videos. This endpoint will return the OTP and PlaybackInfo. The front end would handle the response and load the video. For popular Content Management Systems you will only need to install VdoCipher plugin. Our plugin handles the OTP and PlaybackInfo generation by itself, so that embedding videos to your website is easy and straightforward. As you can see, adding security features to videos creates additional steps to your workflow beyond simply adding a single embed code. We fully understand that there might be things that you would need our help for. Our support executives are available at all times to help you secure your encrypted videos to your site. We are fully committed to providing you Hollywood-level DRM for your invaluable intellectual property, and to support you in creating your video-based business.